There is nothing better than going away for a night, a weekend, or a week (or two). A change in routine does wonders for the soul, and I’m excited to share with you some of the incredible places that Host Unusual has to offer. From private islands, castles, hobbit huts, boats and lighthouses, to windmills, caves, gate houses, a temple (how gorgeous?) and railway carriages. Host Unusual have it covered, and I’m so pleased that I stumbled across their website. 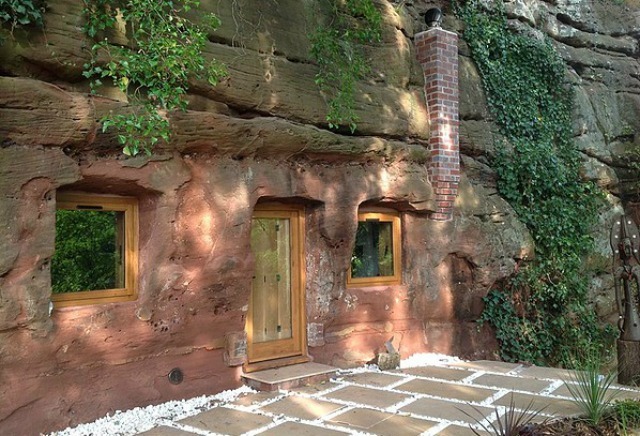 A rockhouse – The UK’s first contemporary ‘rockhouse’, carved straight out of a rock. It was abandoned in the 60’s, and has since been renovated to provide the perfect escape from modern life. A bed chamber – The Penny Rope bed chamber has been created to give guests a taste of prison life. A single set of bunk beds, bars at the window, tin mugs and an old fashioned lock and key. However, it’s the only cell in the country that prisoners won’t want to leave. 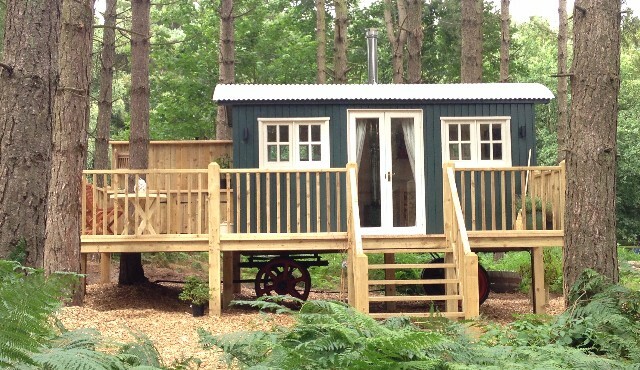 A shepherd’s hut – An opportunity to stay in a handcrafted shepherd’s hut, close to the coast, and set amongst nature. They’re perfect for romance, families or for relaxation and rejuvenation. The huts are fully equipped to fulfil all of your glamping needs. A WWII bunker – Jared and I have stayed in a WWII bunker before in Budapest. It was spacious, a great experience and we had fantastic views of the city. ‘The Bunker’ in Cornwall is perfect for 6 guests, and leaves little trace of its past (other than being almost entirely covered in grass), as it’s modern, airy and clean. 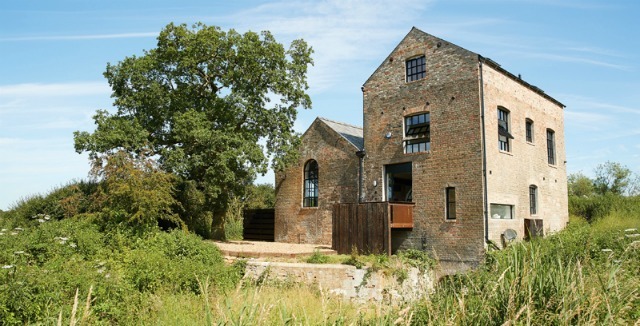 A pump house – This is a refurbished pump house that offers luxurious self catering accommodation for larger parties. It is surrounded by fields, marshes and farmland in beautiful Norfolk. The historic features have been perfectly blended with modern design to create a magnificent work of art. A tree house – A treetop retreat under a forest canopy. 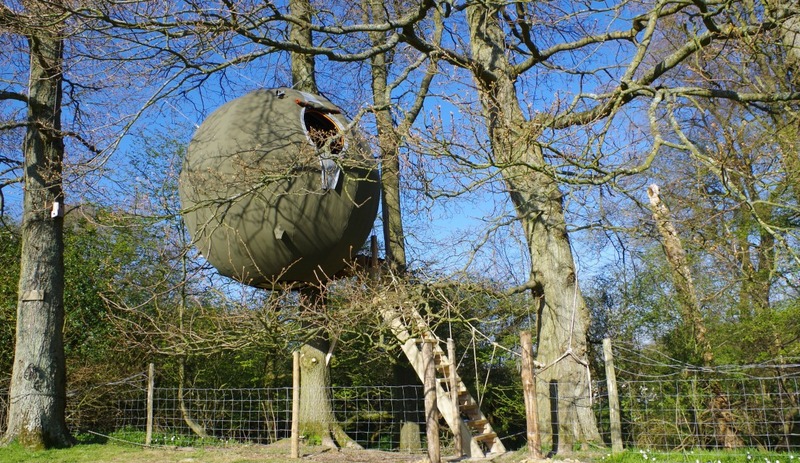 The treetop pods offer privacy and seclusion, and have a thoughtful open plan design. A wood burner provides the heart and soul of the tree house. They are accessed via a spiral staircase and a wooden bridge. Secret Shelters – These are the first of its kind in the UK. A suspended spherical ‘tree tent’, with three built in beds. Sleep amongst the wildlife for a truly unforgettable experience. Lendal Tower – Right on the edge of the River Ouse in York, Lendal tower offers panoramic views of the city. Lendal Tower was built in the 14th century, and has now been lovingly restored to accommodate six guests – complete with stone walls and timber beams, to create an indulgent, homely space. 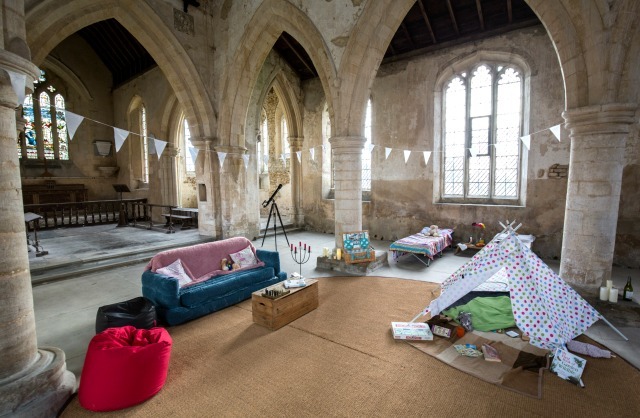 Champing in Aldwincle – I can’t decide if the idea of sleeping in an old church is appealing, or slightly scary. ‘Champing’ gives you the exclusive use of some of the UK’s most incredible listed buildings for a memorable sleepover. All Saints church in Northamptonshire is a Grade I listed building and can host up to 16 guests. The Curious Cabinet – This magical guesthouse in the heart of Bristol is a beautiful sanctuary of warmth intended to take you far away from the distractions of modern life. Every last eclectic detail has thoughtfully been cared for, and delightful touches are everywhere. It’s luxurious, and enchanting. I’ve added Host Unusual to my list of websites (along with my trusty i-escape and Airbnb), for when wanderlust gets the better of me. Oh I love it! What an amazing website, this is totally my sort of thing. I’m off to waste the rest of the evening finding somewhere amazing to stay!